This Ecuador tour offers unique experiences in diverse landscapes – from the breathtaking UNESCO Yasuni Biosphere Reserve to the scenic volcano region of Cotopaxi and Riobamba. 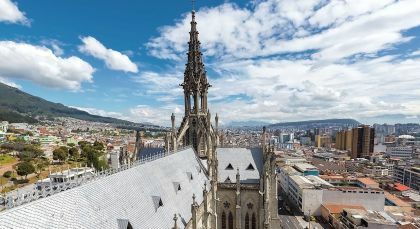 Also, unearth the charms of Quito, the most visited city of South America, and the colonial and Inca heritage of Cuenca. 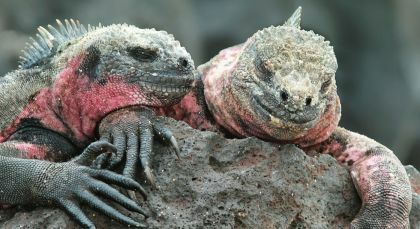 End your vacation on the high seas, cruising the majestic Galapagos Islands at a leisurely pace. The capital of Ecuador, Quito, is one of the most visited cities in South America. Surrounded by volcanoes and the Andean highlands, the city provides a cultural feast with its many churches and monasteries. Located in northeast Ecuador, the UNESCO site of Yasuni Biosphere Reserve and National Park is one of few places in the world where plant, mammal, amphibian, and bird species all reach their maximum biodiversity. Pick up at Coca airport. 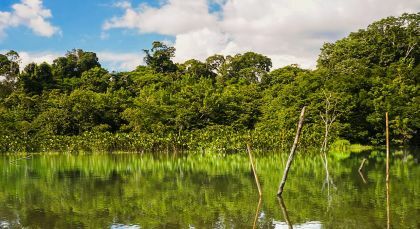 The activities of the day begin with a two-hour motorboat ride along the Napo River, a privileged opportunity to observe majestic Amazonian wildlife species such as kingfishers and herons. Embark on a paddle-canoe journey along the estuaries leading to the Napo Wildlife Center standing on the shores of the Añagu Lake. On day two, visit several parrot clay licks and admire the colorful spectacle of more than 11 species of birds coming together to feed with the minerals concentrated in the soil. In the afternoon, hike a forest trail leading to a local township to learn about the customs and traditions of the Kichwa Añagu Community. On day three, climb 36 meters high to the Canopy Observation tower where flocks of birds such as vibrantly colored tanagers, macaws and toucans will pass you by. In the afternoon, explore the lower levels of the forest that are home to lizards, monkeys, rare insects and snakes. Also keep your eyes open for Giant Otters at the black Añagu Lake. On day four, slowly sink in the sounds and sights of the forest as you enjoy the paddle-cannoe and motorboat ride back to Coca. 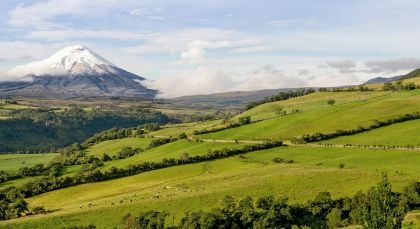 The Cotopaxi province of Ecuador is home to what German explorer Alexander von Humboldt coined ‘The Avenue of Volcanoes’ and contains some of the most dramatic mountain scenery of the country. Riobamba is situated 2750 meters above sea level and surrounded by majestic volcanoes, some of which are still active. Because of this privileged location, the city is also known as ‚Sultana of the Andes‘. Venture into the scenic Panamericana South Highway towards the breathtaking Cotopaxi peak, the world’s highest active volcano at 5,897 meters of altitude. Stroll around the vast Limpiopungo Lake to sink in the magnificent views of the snowcapped Cotopaxi and nearby Rumiñahui peaks. 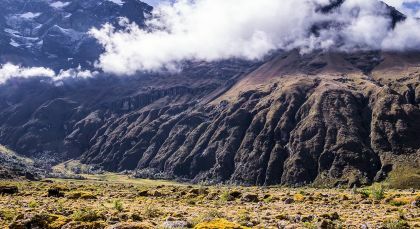 A short trek in the National Park may grant you the opportunity to admire unique wildlife species such as the Andean condor, the Andean fox, the Andean spectacled bear, the white-tailed or little red brocket deer. Before heading out, stop by the Interpretation Centre to pick up a handmade souvenir or to grab snacks to take along for the drive towards Riobamba. 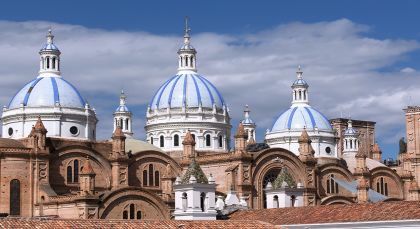 Cuenca is Ecuador’s third largest city and situated in the highlands of Ecuador at 2500 meters. Originally an Incan city, it was conquered by the Spaniards in the 16th century. After breakfast we will head to Alausi, a charming village where you can observe local residents in full traditional ethnic wear. From the heights of Loma de Llugli, feel the gaze of Saint Peter bestowing his blessings as you hop on the public train towards the Devil’s Nose station. En route to Cuenca, you will visit the archaeological site of Ingapirica, the most important and best preserved Inca ruins of Ecuador. Envision what life was like for the early Cañari settlers who built the Sun Temple, the Incas who converted the site to a military stronghold or the Spanish who built new cities with original stones from this sacred place. Learn more at the museum before lunchtime and relax afterwards for the remaining two hour journey towards the beautiful city of Cuenca. Recognized as a UNESCO World Heritage site, the colonial city of Cuenca is best appreciated by foot. 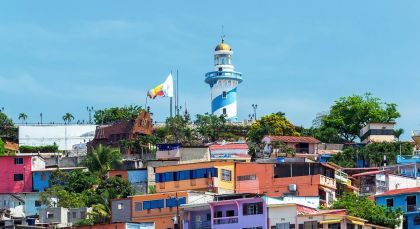 Experience the beauty and atmosphere of the Old Town as you browse through its flower and handicrafts markets, step into art galleries and magnificent churches, admire the beautiful colonial buildings with wrought iron balconies and carved wooden doors. Choose from a variety of museum exhibitions ranging from religious and colonial art to archaeological relics and anthropological exhibitions of various ethnic groups of Ecuador. Appreciate the differences among modern neighborhoods and historic houses perched on cliffs high above the Tomebamba River. You will be treated to an amazing panoramic view from Turi point, and as per your preference, the tour will conclude with a visit to a ceramic art gallery, a Panama hat factory or a local artist’s workshop. Guayaquil, the ‘Pearl of the Pacific’ is Ecuador’s largest city and an important trading center of this small Andean country. After breakfast we will take you on a drive (3 hours, 30 minutes) towards the coastal region of Naranjito. A select setting amidst teak wood trees and rivers welcomes you to the Hacienda La Danesa, an authentic countryside experience. Managed by the third generation Olsen family, the once traditional dairy and cacao farm has taken a bet on sustainable tourism. Exclusive guided tours enlighten visitors on the process of transforming cocoa almonds into fine artisan chocolates. You will also get an opportunity to walk through banana plantations and to observe the daily farm activities that contribute to the restaurant’s farm-to-table menu. Savor an exquisite health conscious organic-based lunch prepared with ingredients grown or sourced from the local community. The evening ends with a one-hour drive to your hotel in Guayaquil. Located 1400 km west of mainland Ecuador and reached by small boats, the Galapagos Islands are a strictly protected, beautiful UNESCO World Heritage site.